Highlights: Porsche has finally responded to local requests for a diesel version of its polarising Cayenne - and the improvement of diesel fuel hasn't hurt the process either. The Cayenne Diesel will be on display for the first three days of the show, and features a VW-sourced 3.0-litre V6 turbo diesel engine producing 176 kW and 550 Nm matched to a tiptronic six-speed auto as standard. Fuel consumption sits at 9.3L/100km, a full 3.6L less than the lightest sipper in the petrol range, the base V6. Australia-bound: Yes, on sale from April this year at $101,990. 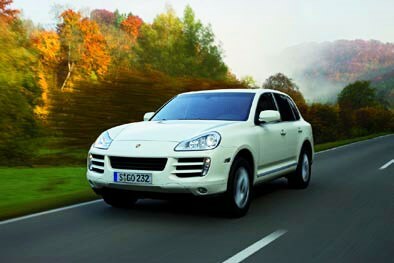 Porsche Australia will display its new Cayenne Diesel for the first three days only of the Melbourne Motor Show. The Cayenne Diesel has been introduced in response to strong local inquiry, and will share the Porsche stand with the second generation Cayman and Boxster. It will appear at the Motor Show from 5 pm to 10 pm on the opening Friday, then from 10 am to 10 pm on Saturday and Sunday until 1 March. Porsche has equipped the Cayenne Diesel with a 3.0-litre V6 turbo diesel engine producing 176 kW of power and 550 Nm of torque. In line with Porsche's commitment to reducing fuel consumption across its range of sports cars, the average fuel consumption of the Cayenne Diesel is 9.3 litres per 100 km, with CO2 emissions of 244 grams per kilojoule. The new Cayenne Diesel will go on sale in Australia in April 2009, priced from $101,990 with Tiptronic transmission as standard.